Ma Emilia was my spouse's maternal grandmother. Unfortunately, I did not get to know his paternal grandmother, as she died when my husband was a teenager. I did, however, have the good fortune to spend many years with Mama Emilia. Emilia was from Abo, a group of villages in the Littoral region. The Abos are of a similar ethnicity as the Dualas. Unfortunately, it was very difficult to get there, and in 12 years, I never visited. She spoke Abo, Duala, and Pidgin English, but no French or English. We communicated through sign language and translators, until I learned enough Duala to get by. She was raised in the village of Besunkan, in the Abo region, and moved to the village of Banseng when she married. 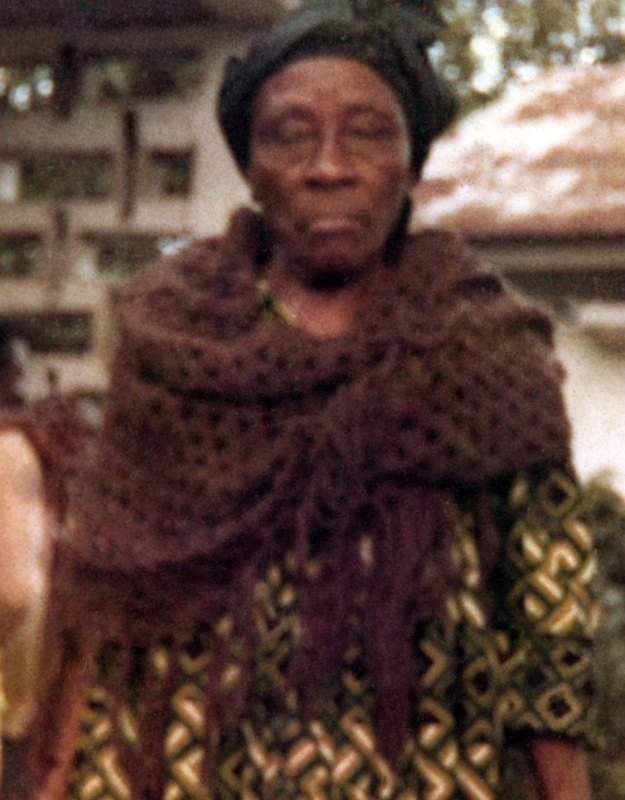 Her husband spoke fluent German; at the time, Cameroon was a German colony. After WW I, Germany, having lost the war, also lost its colonies, and the French took over Cameroon as part of their mandate. Those Cameroonians who spoke German were not dealt with tenderly, speaking euphemistically. The couple moved to Douala to escape persecution, to Bona'Ntone, part of Deido (one of the original three villages forming Douala). Emilia brought along her two younger brothers; their parents were deceased, and she acted essentially as their mother. Both brothers received an education; the eldest was one of the first "clerks" at the SHO French commercial organization. The second brother studied medicine, and had almost finished, when he had a health setback. My father-in-law noticed Emilia's older daughter, who was very pretty and fashionable, and fell in love. By the time I arrived in Cameroon, Ma Emilia was living in our family compound, in my father-in-law's house. Her second daughter lived in another neighborhood; my mother-in-law was her eldest. I'd try to grow some plants in our rather thankless garden; I'd come out in the morning and find her pulling out my shoots. We'd get into an argument with whatever language and hand signs we could muster; Bello, my brother-in-law, would come running over to translate, and told me she considered my plants "weeds!" Her "vices" were her little tobacco pipe, and having a small glass of vermouth ("Martini") in our living room in the evening. During the end-of-year holiday season, she would sit under the mango tree, in the front yard, and put her chin in her hand. When I'd ask her why, she told me that holidays saddened her, because that was the time of year both of her parents passed away. The first time I had malaria--I took anti-malaria pills for a couple of years, but it's not very healthy to take them for your whole life--I was alone at home, and it was like a terrible flu, with someone beating you up, all at once. I was also sick to my stomach, and had to drag myself to the bathroom. She came over and remained by my side every minute; unused to company in such an embarrassing situation, I asked her to leave for a little while. She refused, saying that when she'd be ill, I'd be around too, to care for her. When she was about 75, she decided to start a small plantation on a plot of land behind the one we were living in. She'd go every morning around 5 a.m., and bring back various tubers. She never appeared to care that I was "white," her only concern was communication. When I learned a little Duala, she complained that I hadn't learned Abo! It was great that she was able to enjoy a couple of her great-grandchildren. We had 4 generations in our compound for several years. That is the nice side of the African extended family (as in other parts of the world, too): no nursing homes where older people are far away from their families. I hope Emilia is still watching over us as she used to, with the eyes of her spirit, now. From time to time, my posts will feature a person who is not with us any longer. This is not meant to be morbid, quite the contrary. I write about them because they are alive in my memory, and because otherwise, they may be forgotten. Of course, I'll be writing about those I remember with affection. We still laugh out loud thinking of my father-in-law's expressions, and imagine what his reaction would be to some of the new configurations in the family. Love lives on, all over the world. 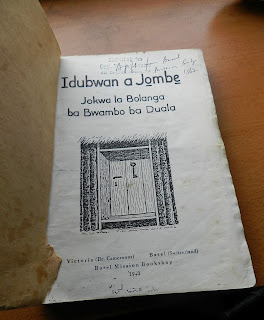 Having been raised in a multilingual household, and encouraged early on to learn the language of the country I happened to be living in, I planned on learning Duala, my husband's native language (albeit not his mother tongue, as his mother spoke Abo, and taught it to all her children). It turned out to be a different kind of endeavor than in countries which have one main native language, such as Germany or Italy. Anyone could live their whole life in Douala without knowing a single word of Duala. Cameroon boasts about 200 languages, and the official languages are French and English (former mandate administrators). Most Cameroonians speak one of these two languages. Moreover, Douala is now home to members of just about every ethnic group in Cameroon, as it is the commercial capital. The political capital is Yaoundé, further inland; it has about half the population of Douala. Less than a hundred years ago, many Cameroonians (from the southern part) spoke Duala, which was the lingua franca in the area. 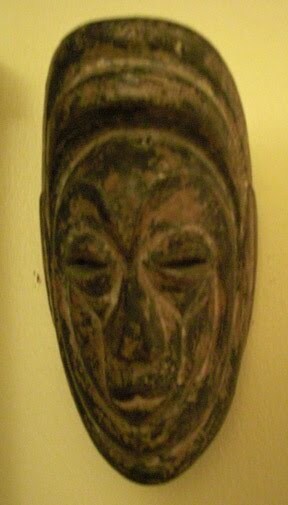 Historically, Douala was the entry point when the first Europeans arrived. However, in recent years, the Duala-speaking population shrank to about 300,000 people. The lingua franca now is Pidgin English. It was difficult to practice the language, as nobody would spontaneously speak to me in Duala, as I didn't need to open my mouth to be immediately perceived as a foreigner. Except for the people I knew personally, it was difficult for me to know who was a Duala speaker or not. My father's constant advice not to fear ridicule while learning a language was my mantra. First I tried learning by listening and asking questions. However, this didn't work, as the structure of the language was unlike the languages I was used to and as my in-laws had not learned grammar, they couldn't explain what seemed to be inconsistencies to me. I started attending Friday evening adult classes at Collège Lieberman, a Catholic high school (in France, a Collège is a school that goes from 7th to 9th grade approximately; however Lieberman took its students all the way to the Baccalauréat, i.e. end of high school in the French system). The students attending class were either foreign wives like me (mostly French), or members of other ethnic groups who wished to learn Duala. We had two teachers, and a slim book. It was not easy! Bantu languages are structured completely differently than Latin or other European languages. Singular and plural happen at the beginning of a word instead of the end: for example, an onion is "janga," onions is "manga." The rest of the sentence follows the same prefix, so you'll have sentences where all you hear is a series of "m," or "j"... unfortunately, I never reached a high enough level to be able to figure it all out, as I didn't get a lot of practice. After 2 years of classes, I acquired a general understanding of the language. I purchased the books for Bassa and Ewondo, also, out of curiosity. 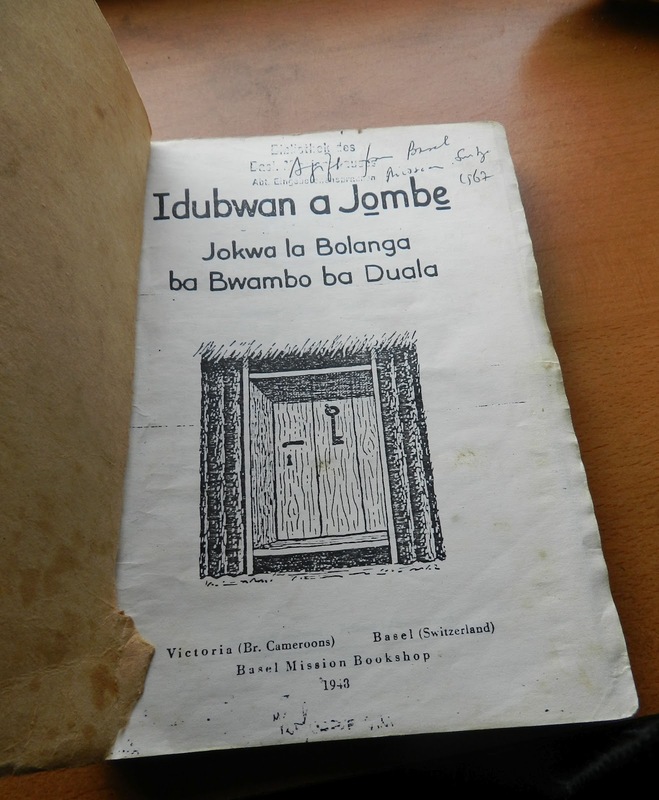 The structure for these languages, all in the Bantu family, was the same; Abo, my mother-in-law's language, was also similar; the vocabulary and the consonants used were different. I did not get a chance to study Bamiléké, which is a group of "semi-Bantu" languages, or any other the languages from North Cameroon, which were closer in nature to those of West Africa.